Significant security consequences associated with weak or failing states (including mass atrocities, regional spillover, and transnational organized crime). Enhance our ability to maneuver freely in the electromagnetic spectrum by equipping our ships with more capability to intercept signals and conduct information warfare, and by adding jamming and deception capabilities to counter advanced anti-ship missiles. The budget request also supports the Next Generation Jammer, providing the EA-18G GROWLER with enhanced Airborne Electronic Attack capabilities starting in 2021. Strengthen our cyber posture by developing systems to deter, detect, and mitigate insider threats and safeguard classified national security information. 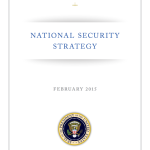 We will also align Navy networks with a more defensible DOD Joint Information Environment through installations of Consolidated Afloat Networks and Enterprise Services (CANES) on combatants and at Maritime Operation Centers; implement the Next Generation Enterprise Network (NGEN) ashore; and consolidate data centers. In addition, we are establishing a single Navy “CYBERSAFE” authority to manage cyber security of Navy-wide networks, platforms, BE READY America’s Navy is at its best when operating forward. Our overseas presence gives the President options, and bolsters global stability through frequent engagement with allies and partners, building trust and confidence. 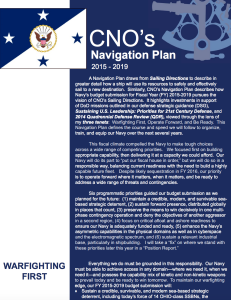 OPERATE FORWARD – While no individual bullet point sites a specific task for the Information Dominance Corps (IDC) the major move to push more ships & forces forward, increase their Operational Tempo, and rotate crews at the edge are major changes. Thus the IDC importance is built within every bullet point listed. These changes make the Network and Communication mission sets of the IDC more significant. It also challenges network availability & integrity while stressing satellite and terrestrial communication pathways with higher traffic loads and most likely a more congested spectrum loading. Continues to evolve Information Dominance as a mainstream warfighting discipline by establishing a dedicated Type Commander – the Navy Information Dominance Forces Command – responsible for the readiness of intelligence, oceanography and meteorology, information warfare, networks, and space capabilities. 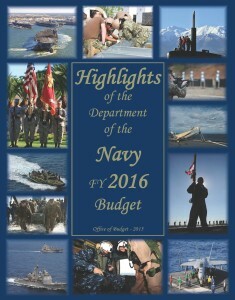 Make sure to review the CNO’s 2012 update in his 2012 CNO’s Postion Report and the 2013 CNO Navigation Plan!